You have built a great team and successfully created an environment and culture that allows your team members to thrive. However, how do you ensure that your team members succeed and continue to excel? 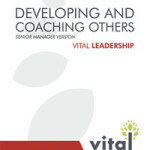 Developing your coaching skills allows your team members to benefit from the knowledge that made you successful. To help your team succeed, you need the skills and strategies to effectively guide your team through a learning process. Your ability to coach your team members ensures that the resources invested in training and developing your team result in positive behavioral change and performance improvement. 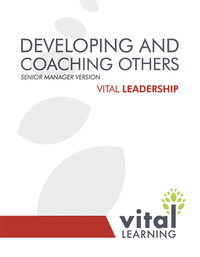 The Vital Learning Developing and Coaching Others™ course teaches managers and team leaders to effectively and successfully develop and coach their team members to become better and more consistent performers. The course helps managers and team leaders learn the specifics of how they can influence the learning process and hold “coaching moments” with team members to change undesirable behavior and improve productivity and performance. Click on the “e” to immediately enroll and begin the Developing and Coaching Others online course.